Title: 'A Map Of Upwards Of 25 Miles Round The Town Of Birmingham'. ‘A MAP OF UPWARDS OF 25 MILES ROUND THE TOWN OF BIRMINGHAM. To his most sacred MAJESTY GEORGE the THIRD, KING OF GREAT BRITAIN, &c,&c. This MAP, with permission, is respectfully inscribed by Jas. Sherriff.’ North is at the top of the map. The scale is in a cartouche bottom left, with a ruler showing statute and geographical miles on a background of measuring tools. 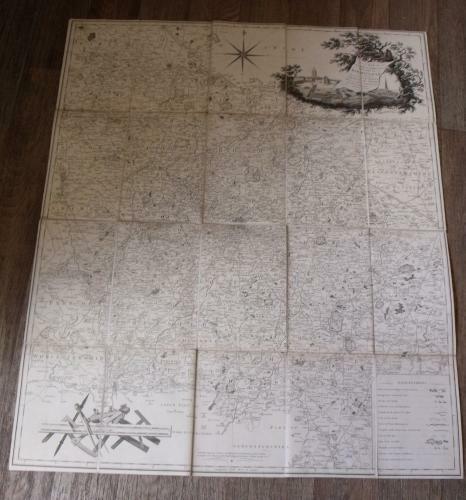 The map covers all of Warwickshire, with some of Staffordshire and Worcestershire. Birmingham is at the centre. This was a new development, showing the area around a major town, rather than depicting an individual county. Three of the corners are taken up by cartouches, but the map extends to the edges where possible. This is particularly useful for Birmingham, which lay on the edge of Warwickshire. Frequently with previous county maps there was only white space beyond the boundary. Major towns might be indicated, but the roads leading to them might not appear. There were anomalies for historic reasons; islands of one county being situated in the middle of another. Dudley was part of Worcestershire, but surrounded by Staffordshire; Tardebigge was part of Warwickshire, but was surrounded by Worcestershire. These islands appeared on some maps as white holes in the middle of a county. The first map of this type had shown ‘the Country Twenty Miles Round London’, engraved by Cary, published in 1782. This map was produced by James Sherriff, surveyed 1788 – 1796, and published in 1798. James Sherriff is listed in a 1798 Birmingham trade directory as a Land surveyor, New St. He had diversified by 1812, when he appears in Wrightson’s directory as a ‘surveyor and British wine maker’, in the Crescent. He also produced maps of the ‘Environs of Liverpool’ in 1800 and 1823. The key – ‘Explanations’ – has synbols which differentiate between classes of road, i.e. ‘Turnpike Roads’, and ‘Cross and Bye Roads’. There are separate symbols for ‘Coal and Lime Pits’. Completed and projected canals are shown by the same symbol; the Birmingham-Warwick canal was not completed until the following year. Some hills, such as Lickey Beacon, are shown by hachuring. The map is very accurate for Birmingham and the outskirts. Many places around Birmingham, now suburbs, appear for the first time. For most the spelling is modern. Aston is now ‘Aston juxta (next to) Birmingham. In addition to the large halls, some other buildings are shown; ‘School’, Office’ , ‘Garrison’, ‘New Brewery’. The area near Soho Foundry is named ‘Moneybag Hill’, this may be a reference to the first steam-powered mint in the world, built by Matthew Boulton in 1788. In very good condition, with the marbled folder.